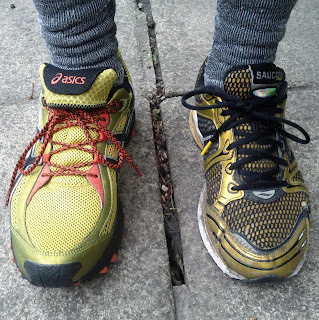 It's just approaching 6 years now that I've been living over in the UK and it's been not much less time since I've had a new pair of running shoes. Sufficed to say it was time for an upgrade. I was lucky enough to have taken delivery of a new pair of trail running shoes that Sports Direct had kindly sent me to review. I opened the box to reveal a surprisingly handsome pair of shoes the Asics Gel Trabuco 14. I suspect some of you might not be too keen on the colour, but for me, I like my shoes to stand out from the crowd a bit. I put them to the test with a half hour wet trail run, I felt like I was running on a cloud. Notably, running downhill, they absorbed the full force of impact and gripped the terrain impeccably. I was very impressed and busting to get out there again and put them to the test some more. This is the latest release of this model of shoe. Personally, I've not had the opportunity to compare previous models with. 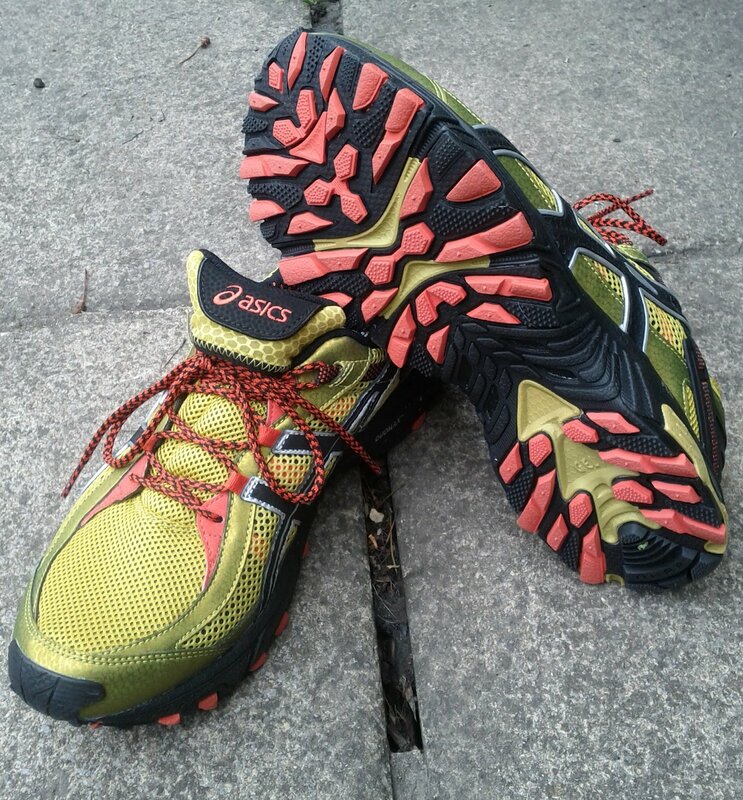 However, I've found some mixed opinion out there with this latest version saying that it's less of a true, hard-core trail shoe, a bit wider than normal and that the lacing system is completely different without the normal second usuable hole to butterfly lace your shoe to help hold your foot and ankle in place. I can attest to the latter criticism myself as when I went running through some wet muddy ground in my last run the shoe got a bit stuck and my foot almost came out of the shoe. A long-standing favourite of trail runners, GEL-TRABUCO 14 is the most performance-oriented edition yet. The rugged outsole offers excellent trail traction combined with a comfortable feel. The Rearfoot and Forefoot GEL Cushioning System that eases the shock experienced during the impact and toe-off phases, while the Solyte Midsole Material, a lighter compound than ASICS’ standard EVA and SpEVA, not only reduces weight but also enhances cushioning and durability. Also helping to reduce weight of the sole unit is the Trusstic System with no loss of structural integrity. A Trail Specific Outsole features reversed lugs for excellent uphill and downhill traction on all types of terrain, while ASICS High Abrasion Resistant rubber placed in critical areas of the outsole provides exceptional durability. In the midsole area, the dual density Duomax Support System enhances support and stability. A Rock Protection Plate helps to protect against stone bruises. It appears that The Pirate Bay is down for some at the moment, but not everywhere. There has been a lot of press recently about ISP blocks in the UK and other countries. This has leads many to think that if they've been able to access the site and suddenly they can't something horrible has happened to the site. There's been a few posts (post 1, post 2, post 3) regarding it on their official facebook page. It seems that the issues is linked to issues with PORT80 the owner of the IP is a Swedish ISP who supplies bandwidth to the Pirate Party, and others. A few of the proxies still seem to be working still. I've had the luck of being on the receiving end of the most recent blocking by Virgin Media for thepriatebay.se site. There's a few ways to get around this actually; I'll describe a few over the next few weeks beginning with the simplest one today. The fastest and easiest solution I've found was the following. Some words of wisdom with this method. You'll want to pause the downloading until you're back onto your high speed broadband connection otherwise you could incur some large data charges or throttling of service. Let me know if there's other networks this works on in the comments below.